According to a report by Gartner (Q1, 2016), 80% of companies using cloud email with revenue above $10 billion have subscribed to Microsoft service and Google has close to 50% market share in relatively smaller company segment (revenue less than $50 million). Although it is early days for cloud email adoption, both Microsoft and Google have achieved significant traction among enterprises of different sizes, industries and geographies. Gmail is part of “Google Apps for Work”, so you’ll get Google Calendar, Google Docs, Google Slides, Google Drive and more. If you’re already familiar with the free version, it is easier to customize settings for your business requirement. The iOS and Android apps can be used to read and draft messages even if you’re offline, and they will be sent once the app gets back online. Gmail starter plan gives 30 GB storage for Drive and Gmail for $5 per user per month and the unlimited storage plan is available for $10 per user per month. Note: TeamWave (CRM, Project Management & HR Software) is fully integrated with Google Apps for Work. Microsoft Exchange Online gives you access to email, calendar and contacts via web browser, Outlook app for both iOS and Android. You’ll be able to collaborate on documents using OneDrive and create work groups for your employees. There is option to buy it a independent service or as part of Microsoft 365. There are two plans – $4 user/month gives 50 GB mailbox storage with ability to send emails up to 150 MB in size and $8 user/month has unlimited storage using In-Place Archives. Amazon WorkMail came out of preview mode back in January, 2016. Email and calendar can be integrated with Microsoft Outlook client (native support on both Windows and Mac OS X) and accessed via web browser, native iOS and Android app. Amazon WorkMail also gives you enterprise grade security and option to choose data storage location by selecting the AWS region. It costs $4 per user per month which gives 50GB storage per user. Yahoo Small Business was rebranded as Aabaco Small Business in December, 2015. Their unique offerings are 1 TB of free space (1000 GB) for all the plans and a free domain if you maintain an active Business Mail subscription. Price starts from $3.19 for single mailbox per month when billed annually and gradually comes down with purchase of multiple mailboxes ($1.59 for 5 mailboxes). 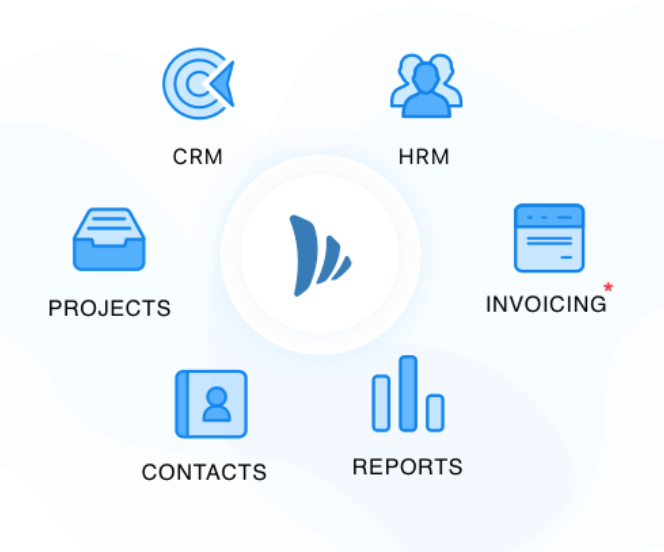 Plug: TeamWave is an integrated suite of business applications for small & medium-sized companies. Apps include CRM, Project Management, HRIS, Invoicing & Contact Management. Rackspace webmail comes with 100% Uptime Guarantee and free migration service while switching from existing mail provider. Gives you access to mail from Outlook and mobile apps via IMAP. There is three layers of scanning for spam and virus protection. Mailboxes come with 25 GB storage and message size can go up to 50 MB. Price starts from $2 per user per month and $3 per user per month plan gives you unlimited storage via archiving. GMX provides free email service and positions itself as all-in-one service. It offers webmail with unlimited storage and allows you to send emails with up to 50 MB attachments. You also get online calendar, email archive, antivirus and spam filter. Icewrap offers integrated solution for webmail, document management, calendar, webchat, meeting and webphone. They also offer native support for Outlook 2013, windows 8 & 10 Mail/People/Calendar support, antivirus, spam protection and a lot more. Price starts from $380 per month with 100 GB storage for unlimited users. Kerio Cloud offering gives you email, calendar, contacts, notes, instant messaging and VoIP phone system. It supports IMAP and POP compliant email clients across Windows, Linux and Mac operating systems. They use direct push synchronisation to keep your mailbox synced in any kind of smartphone OS (iOS, Android to Symbian). $4.99 per month pricing gets you 10 GB mailbox and $8.99 plan offers unlimited mailboxes. Email archiving will cost $3.00/mailbox. Ipswitch IMail offers 2 GB storage per mailbox and stores data in Virtual Private Server. Anti-virus and anti-spam protection is powered by Cyren. For a 10 member team, the most basic plan for a year will cost $199. Microsoft Exchange ActiveSync will cost $4.99 per user to sync mobile devices with email, calendar, contacts and tasks. Atmail pioneered one of the first businesses webmail applications and they have been innovating in the email space since 1998. You can manage email, calendar and contacts on the mobile device and get support for desktop clients (example: Outlook and Apple Mail) as well. It costs $79 per month for 50 users with 500 GB storage quota.